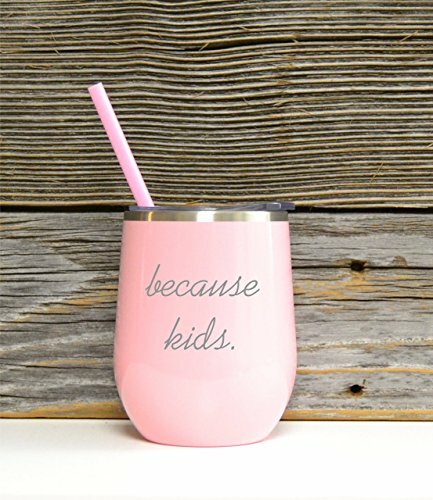 Because Kids Stainless Wine Glass in Pink Color with Clear Plastic Lid and Coordinating Straw. Glasses will have stainless writing only. We do not use any stickers on our glasses. We permanently engrave each glass. Private message us for other individual needs you may have. Our Stemless Metal Wine Glasses are made of 100% BPA-free 18/8 grade steel. They are double wall vacuum insulated and can be used for both hot and cold liquids. We recommend hand washing your glasses for optimal care. Do not use bleach or products containing chlorine to clean. DO NOT MICROWAVE! If you have any questions about this product by Homestead Engraving, contact us by completing and submitting the form below. If you are looking for a specif part number, please include it with your message.